“Oh, you found my Blue Bandana!” exclaimed Elisse with a slight hint of boredom, taking it from the overexcited Blumaroo’s hands. She blessed him in return, and as he left, let out a sigh. Thankfully, he was the last one for the day. Giving quests wasn’t a terribly difficult job, but it did get tiring. As a fire faerie, it wasn’t too exciting to wait around for items to be brought to her. Occasionally she wished for more excitement in her life. One could sit around all day for so long. Grasping the bandana, she shot into the sky, searching for her friend Avere. After nearly twenty minutes, she still could not spot her friend's unique mix of red and black that distinguished her from other fire faeries. Avere must have finished early today. It all came down to luck, after all; their quests weren’t timed, so they never knew what time they would finish each day. Slightly annoyed that her friend hadn’t waited, Elisse decided to try her at home. Avere lived in the outskirts of the city, where the crowds and hustle and bustle could not be heard. Elisse rather liked the area. It was peaceful, and you could practically breathe the magic that permeated the air. Avere’s cloud-covered house blended with Faerieland’s natural surroundings. It was almost like a private Hidden Tower, but Elisse had been there so many times it was impossible to miss. Elisse landed lightly on the front step and knocked on the door, one of the only things not obscured by clouds. She waited a couple of minutes while she tied her new blue bandana around her neck, but no response came. She knocked again, waiting only a few seconds before impatiently trying the door. “Ouch!” she yelped, withdrawing her hand quickly. The doorknob was scorching hot, though it didn’t look any different. Despite her kind's tolerance to heat, it had still left a burn mark on her palm. Instantly, she knew something was wrong. Rubbing her hand on her dress to soothe the pain, she prepared to blast the door open. But it seemed that the touch to the doorknob had done the trick—to her surprise, the door opened on its own. Elisse went straight to the dining room, where the two had their daily cups of tea. A quick scan of the room proved that Avere wasn’t there, but as she turned to leave, Elisse caught sight of something that worried her immensely. Avere's circlet lay on the table, placed carefully at her usual seat. 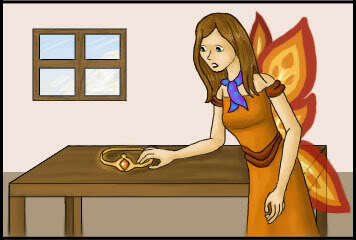 She never left the house without the orange crystal circlet, her prized possession. If Avere's circlet was there, there was no doubt she had been home. So where was she now? “Avere!” she called again. She inspected every room in the house, her spirits dipping further every time she opened a door and found herself staring into another empty room. It wasn’t a large house. It did not take long for Elisse to realize Avere was nowhere to be found. Clanix angrily jabbed his finger onto the entry pad, and then waited impatiently while the computer confirmed the fact that he was indeed Sublevel 23B Assistant Manager of Robot Affairs, that his name was Clanix Gorgat, and that he was a rather squat and frustrated purple Grundo. Then, the computer's pleasant female voice announced all of this to him as if he wasn't already aware. He gasped in relief when the gleaming door finally slid open and rushed forward into the storage bay. Paying no attention to the sheer size of the room, he hurried past the scads of developmental weapons that the room concealed, looking for the correct aisle by referring to the small data-watch he wore on his left wrist. Once he had located aisle 42-L, he began what he had been sent to do, or rather, what the robots were supposed to do. Grumbling, he began checking the call number of every failed or untested weapon in the row. He was irritated that the robots had reported a missing item, which in Space Station protocol meant that a Neopet supervisor had to double-check the report, along with every other item in the aisle for safety's sake. How was it possible at all for an item, especially the weapon in question, to go missing from a highly secured storage bay? It was impossible. What were robots good for? They could follow basic instructions, yes, but when they came across something that may have been just slightly out of order they went haywire and reported a theft. Clanix scoffed at the sheer lunacy of it all. He would rather be transformed into a mutant by Doctor Sloth himself than be a robot. To lose any sense of freedom, well, he couldn't fathom it. Humming to himself quietly as he checked barcodes against his data-watch, it took him a moment to register the gaping space he came across after nearly twenty minutes of working. "It... that's impossible," he said. "What... how... who?!" Horror washing over him, he typed into his data-watch the call number of the missing item. After a moment, the results popped up on the screen: Item 481516. Clanix nearly fainted when he saw what the missing weapon's function was. A Flame Engineer DG9. Discontinued for causing "mysterious explosions." And it had disappeared, on Clanix's supervision. The villagers of Mystery Island had feared this day for nearly ten years. The last outburst had been so terrible, so horrific, that they prayed to the heavens for it never to occur again. And for a while, it seemed that their hopes had been answered. It had remained quiet for almost a full decade. The villagers rebuilt their destroyed towns and moved on, occasionally glancing up at the reminder that never went away, the overbearing face. Its soulless eyes, its lifeless smile seemed to mock the villagers, but what could they do? They understandably preferred a constant reminder instead of the outbursts themselves. But today they had both. Whispers permeated throughout the towns, a low rumble to match that of what they feared. It had started the previous afternoon, quietly at first but soon growing exponentially. Villagers stopped randomly in the streets and glanced up at it, fear and awe etched onto their faces. Blockades were built hastily; no one believed they would do anything at all, but it gave them something to do. It was with immense worry that the villagers retreated to their beds that night. When they awoke the following morning, the worry had grown into full-blown anxiety. As they emerged from their huts, they realized their anxiety was not without cause—an enormous column of black smoke was rising into the sky. The volcano, with the lifeless Techo carved into its side, was live again. There was nothing to do now but wait. It had been quite a long night for Maurice, the security guard at the National Neopian Bank. Instead of getting rest, he was forced to take care of his small daughter, who had come down with a bad cold. The yellow Tonu could barely keep his eyes open as he sat at his desk, where he was supposed to be watching the comings and goings of the world's largest bank. His eyelids slowly drooped shut, and all sounds slowly swam out of his consciousness. Unfortunately, that's when it happened. With a swift swipe heard by no one, Maurice slid out of his chair, moaning slightly. He lay facedown on the floor, knocked out from behind. 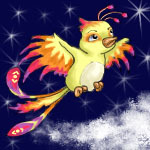 The attacker, a squat faerie Pteri, snatched the weapon on the guard's belt and stowed it in his own pack. Perhaps this will come in handy later. Careful to keep his expression calm, he approached a teller. "Good morning," the Aisha said pleasantly, her black hair shimmering slightly. "How may I help you today?" He smiled. "I need to make a withdrawal." "Very good, sir. Which vault?" she asked as she lifted out an enormous book bound in red containing the vault records. "Ah, now see, there's the problem. I seem to have forgotten my vault number. It's been so long since I've needed to make a withdrawal," he said with a sheepish grin. "May I see that book? I'm sure I could find my name in there." The Aisha frowned. "Unfortunately, we can't allow this book to leave our hands, sir. Security reasons, you know," she said, with a glance towards the guard's desk. After a split second, she froze. He could see the bewilderment in her eyes, and could almost hear what she was wondering: Where'd Maurice go? The split second had passed. An explosion shook the marble floors with an ear-splitting BOOM. Both staff and civilians fell to the floor with a scream as the ground around them rattled. He had only a moment's chance to get past them while they were preoccupied. Wrenching the record book from the teller's hands, he streaked to the entrance of the vaults, their ornate carved doors barely hanging on their hinges. With a flash of orange he searched for a hiding place in order to consult the book. Pushing aside the door that had fallen forward, he slipped into a nearly empty vault; only a few bags of Neopoints remained in the far corner. Hurriedly he flipped through the pages with his wing, searching for the vault he needed. The owner's name became a mantra in his mind as he repeated it over and over in his mind, willing it to appear on each page he was scanning. At last, after what felt like hours of searching, he came across the vault he was looking for. Number 442. With a grin he tossed the book to the side and shot off for his destination. He noticed that these vaults were still in pristine condition; the explosion did not seem to have reached this far into the bank. He could only hope they would not find him while he was in this deep; they must have recovered from the surprise by now. With a pang of worry, he sped up, streaking past vaults. 408, 415, 423, aha! 442 stood in front of him, large and imposing, as if it knew what was about to happen. But he had not come this far to be scared off. Confidently, he stepped forward and pulled the handle. It did not budge. Oh, right, he remembered with a slight smile. He closed his eyes, and allowed his feelings to rise up once more. A flash of a frail red Gelert crossed his mind, and his surroundings rocked once more as a huge explosion erupted. The door in front of him splintered with a sickening crunch, and he peered into the vault. He smiled. There was his objective. He stepped forward and slipped the rusty key from the stone floor into his pack.